Stretching: Many people do work that will eventually lead to repetitive strain injury. Learning how to stretch and take care of your body is a sensible thing to do. These stretches are specific for the upper body and neck. Doing these several times throughout the day when we are feeling the muscles ‘tighten’ can help us relieve the pain as it happens. These are useful for anyone using a computer many hours per day, students, hairdressers, mechanics, massage therapists…anyone who does similar movements with the upper body over and over again. Acupuncture: Has been used for centuries to support better health of the bones, ligaments, tendons and muscles. Why do we need to stretch? When we start to feel that ache or burn in a muscle, it is building up lactic acid. Lactic acid dehydrates the muscle, and eventually the muscle becomes ‘gluey’ and later on the muscle tissue calcifies. Stretches gets the blood supply into the muscles and helps to release the waste products from the muscles, and support re-hydration of the muscles. Massage: When we feel those ‘knots’ during a massage, the muscles are somewhere between ‘gluey’ and ‘calcified’. It can take many hours of massage to remove these knots. Cellular Regeneration: Our Frequency Specific Microcurrent equipment can dissolve these calcifications much more quickly than massage can. Chronic calcification may take many treatments, and long term will prevent surgeries. Nutrition: Muscles which regularly ache require both magnesium and water. Drinking plenty of water is massively important for muscle health and quality. Magnesium products such as Fibroplex (much more potent than any tablets on the market) help to get magnesium into the muscles as quickly as possible. Does histamine control your life? Are you even aware that it might? You might have MCAS!! Much of this information comes from Dr Tania Dempsey and Dr Jill Carnahan in the States…. but it is a Syndrome worth thinking about if you’re simply not getting on top of your pain, allergies, nervous system stresses etc…. Many doctors in Australia are totally unaware of this condition. Mast cells, a type of blood cell, play an important role in the body’s immune system. They reside in all body tissues and form part of the body’s initial defence system. Mast cells react to foreign bodies and injury by releasing a variety of potent chemical mediators, such as histamine, when activated. In a healthy person these chemicals will act beneficially to protect and heal the body, but in a person with MCAS these same chemicals are inappropriately triggered and released and have a negative effect on the body. Amongst the triggers are a variety of different foods, exercise, chemicals, fragrances and stress. Many sufferers struggle to identify their triggers and continue to discover new triggers for many years after diagnosis. MCAS forms part of a spectrum of mast cell disorders involving proliferation and/or excessive sensitivity of mast cells, it has been identified since 2007. It features inappropriate mast cell activation with little or no increase in the number of mast cells, unlike in Mastocytosis*. MCAS causes a wide range of unpleasant, sometimes debilitating, symptoms in any of the different systems of the body, frequently affecting several systems at the same time. The onset of MCAS is often sudden, affecting both children and adults, sometimes in family groups, mimicking many other conditions and presenting a wide-range of different symptoms that can be baffling for both the patient and their physician. Often there are no obvious clinical signs since MCAS confounds the anatomy-based structure underpinning the traditional diagnostic approach. Very often Mast Cell Activation Syndrome is hiding in plain sight. Mastocytosis involves inappropriate mast cell activation AS WELL AS an increased number of mast cells. It is a rare but relatively well known mast cell disorder and is currently easier to diagnose than MCAS. Mast cells are present in most tissues throughout the human body, especially connective tissue, skin, intestinal lining cardiovascular system, nervous system, and reproductive organs. They are part of the allergic response designed to protect us from threat and injury. When the body is exposed to a perceived threat, the mast cells secrete chemical mediators, such as histamine, interleukins, prostaglandins, cytokines, chemokine and various other chemicals stored in the cytoplasm of the cell. These chemical messengers produce both local and systemic effects, such as increased permeability of blood vessels (inflammation and swelling), contraction of smooth muscle (stomach cramps and heart palpitations), and increase mucous production (congestion, sneezing, etc). Historically, we thought of mast cells only in relation to an allergic or anaphylactic response. We now know they play a profound role in immune activation, development of autoimmunity and many other disorders, such as POTS (postural orthostatic tachycardia syndrome). Sadly we are seeing a large increase in patients presenting with mast cell disorders and MCAS. I believe it is in part do to the onslaught of more pervasive environmental toxins, moulds and chemicals. Withouts mast cells, we would not be able to heal from a wound. They protect us from injury and help the body to heal. Unfortunately, overactive mast cells can cause a variety of serious symptoms. Mast cell activation syndrome (MCAS) is a condition symptoms involving the skin, gastrointestinal, cardiovascular, respiratory, and neurologic systems. It can be classified into primary (clonal proliferation or mastocytosis), secondary (due to a specific stimulus), and idiopathic (no identifiable cause). Proposed criteria for the diagnosis of MCAS included episodic symptoms consistent with mast cell mediator release affecting two or more organ systems with hives, swelling, flushing, nausea, vomiting, diarrhea, abdominal pain, low blood pressure, fainting, heart palpitations, wheezing, red eyes, itching, and/or nasal congestion. 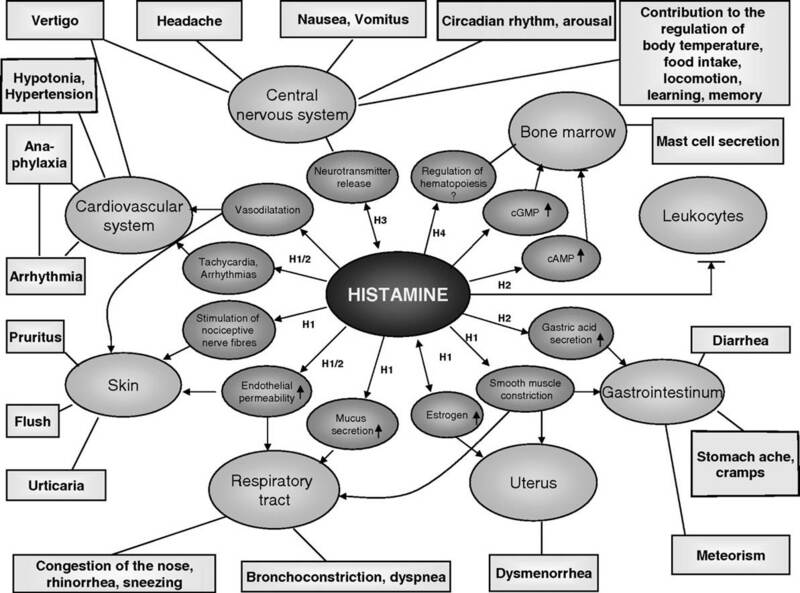 For a diagram of all of the varied symptoms histamine can cause, click here. Triggers may be medications, foods, supplements, hormones, opioids, stressors (physical or emotional), cold temperature, heat, pressure, noxious odors, chemicals, insect bites, trauma or environmental toxins. We commonly see mast cell activation syndromes associated with CIRS (chronic inflammatory response syndrome) in response to biotoxins, such as mould, inflammagens, and lyme-related toxins. Low MSH and Mast Cell Disorders? As mentioned above, we frequently see histamine intolerance and MCAS in patients with mold-related CIRS (chronic inflammatory response syndrome). It is interesting to note that a common finding in CIRS is low MSH. According to this study in the Journal of Investigative Dermatology, alpha-MSH plays an immunomodulatory role during inflammatory and allergic reactions of the skin. In addition, there is evidence that MSH induces mast-cell apoptosis(cell death). Mast cells can be activated by both direct and indirect mechanisms as a result of exposure of the host to pathogens. Mast cells are known to be the primary responders in allergic reactions, orchestrating strong responses to minute amounts of allergens. Several recent observations indicate that they may also have a key role in coordinating the early phases of autoimmune diseases, particularly those involving auto-antibodies. Lab Tests for Mast Cell Activation Syndrome (MCAS) – many of these are as yet unavailable in Australia … Possibly histamine is as yet the only available, but chat to Georgia about what our Naturopathic Labs can offer…. Tryptase is the most famous mast cell mediator. Serum tryptase value is usually normal in MCAS patients, but sometimes it is elevated. Tryptase values that show an increase of 20% + 2 ng/ml above the baseline level are considered diagnostic for MCAS. Chromogranin A is a heat-stable mast cell mediator. High levels can suggest MCAS, but other sources must first be ruled out, such as heart failure, renal insufficiency, neuroendocrine tumors and proton pump inhibitor (PPI) use. Heparin is a very sensitive and specific marker of mast cell activation. However, due to its quick metabolism in the body, it is very difficult to measure reliably. 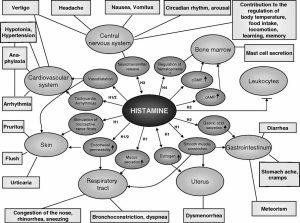 N-methylhistamine is usually measured in a 24 hour urine test to account for the variability in release over the course of the day. Prostaglandin D2 is produced by several other cell types, but mast cell release is responsible for the dominant amount found in the body. PGD2 is less stable than histamine and metabolized completely in 30 minutes. Other less specific mast cell mediators that are sometimes abnormal in MCAS patients include Factor VIII, plasma free norepinephrine, tumor necrosis factor alpha, and interleukin-6. Avoid raw and cured sausage products such as salami. Avoid processed or smoked fish products. Use freshly caught seafood instead. Are you aware of the types of massage we do, the benefits and why we keep offering it for your health problems? Massage is the application of manual techniques to the soft tissue to mobilise them to maintain flexibility. Massage is especially effective in breaking compensatory pain postures and patterns. For example, a tension headache is often self-sustaining because the pain makes the person clench the affected muscles even harder, which, in turn, creates more pain. A thorough neck and shoulder massage can reduce muscle tension and break the pain cycle. One of the immediate benefits of massage is a feeling of deep relaxation and calm. This occurs because massage prompts the release of endorphins, the brain chemicals (neurotransmitters) that produce feelings of wellbeing. Levels of stress hormones, such as adrenalin, cortisol and norepinephrine, are also reduced. 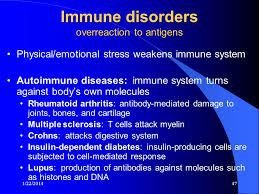 Studies indicate that high levels of stress hormones impair the immune system. Typically, the massage practitioner uses either oil or talcum powder to allow their hands to slip over the person’s skin. Sometimes, a sheet or thin piece of cloth might be used for the same effect. Aromatherapy – essential oils made from selected flowers and plants are added to the massage oil for their particular therapeutic properties. For example, the scent of sandalwood is thought to reduce nervous tension. Baby massage – can help to treat constipation, colic and sleeping problems. Studies have found that regular massage helps premature babies to gain weight at a faster rate. Reflexology – massage of the feet can encourage healing in other parts of the body. Therapeutic – also known as ‘Western’ or ‘Swedish’ massage. One of the most popular forms of massage in Australia, this technique is designed to promote relaxation and improve blood circulation. Remedial – encourages healing of injured soft tissue, such as muscles, tendons and ligaments. Sports – is a blend of techniques that aim to enhance performance and help overworked muscles to recover quickly. Chi Nei Tsang – an abdominal massage process (45-60 minutes on the abdomen) which improves circulation to the abdominal organs, intestines, reproductive organs, muscles and tendons inside the pelvic cavity and lower back. if fractures or broken bones are suspected. Call us on 3348 6098 to see if we can help you! Are you sick and tired of feeling aches and pains, with no particular hope for a better future? No wonder depression and anxiety are linked with chronic pain conditions. Did you know that natural therapies are situated to support your condition – whatever it is – and help you on the road to healing? 1. Our naturopaths can talk through your medical tests, perform new testing processes (looking at your blood; OligoScan heavy metal and mineral levels; VLA BioImpedance Screenings; Insulin Resistance and Cholesterol checks) and help you find the underlying causes of your pain. 2. Our kinesiology processes help to rebalance your pain an inflammation pathways in the body – helping your immune system to function better, remove toxins more easily and help you to heal faster. 4. Our naturopathic supplements are proven to reduce pain and inflammation without side-effects. 5. Microcurrent technology can be used to reduce pain and inflammation in joints, spine, neck, feet etc. 6. Energetic and De-stressing techniques – such as pranic healings; kinesiology, reflexology, remedial massage, microcurrent technology – all can support re-booting your stress systems to function more effectively under stress. Ask how we can help you! Remedial massage at New Leaf Natural Therapies! Our Remedial Massage payment plan is from only $80.50 / month (saves 30%) and if you’re on a payment plan you also save 10-30% on all other treatments and testing processes at New Leaf. Have you heard of the term neuroplasticity and wondered what it means? No, our brains are not made of plastic. However, it does refer to the neural pathways in our brains can be as malleable as plastic allowing our brain to adapt to different circumstances. This means that each signal that enters our brain follows a particular pathway. This pathway can be altered by a change in behaviour. Recently there has been several case studies to confirm the suggestion that chronic pain is not so much a true indication of current pain but that neural pathways have been developed in the brain to re-affirm the original pain that was experienced. Therefore, the pain which we perceive as chronic pain is not a true indication of anatomical pain but a memory of past pain experienced. Neuroplasticity suggests that neural pathway that has developed can be altered via different input. There have been several cases which have successfully abated their chronic pain to minimal or none ultimately changing their lives. This has been achieved via activating the neural pathway pattern and flooding the brain with another sensory input. This in turn allows an alternative neural pathway to develop. Each time the new neural pathway is reinforced allows for the new pathway to develop and the old pathway (of pain) decreases in strength and slowly dissipates. Literally turning the old statement of if you don’t use it you lose it to an advantage! Alternate sensory input may be light or sound. That is, by flooding the neural pathway with another direction to go in each time chronic pain is experienced stimulates new neurons to develop. If this new neuron pathway is reinforced regularly throughout the day the experience of pain has been reported to significantly reduce over a 6 week period. Chronic pain is usually associated with osteoarthritis, rheumatoid arthritis or other degenerative conditions. However, chronic pain is actually classified after 3 months of experiencing pain in the same region consistently. Therefore this includes sports injuries which are often exacerbated by repetitive movements or sitting stationary for long periods of time (often work related). When this starts to happen reactive muscles can be a factor. Reactive muscles is the concept of when one muscle is switched on it essentially bullies other muscles that switch off i.e. muscles are reactive towards one another as opposed to firing when appropriate. Reactive muscles can create dysfunctional movement patterns when the body moves. When this is done repetitively it can be reinforced and put strain on muscles which can lead to events causing injury. Upon injury acute inflammation and pain is experienced which is the body’s warning system to rest that area. However, when the acute inflammation dies down is a crucial stage to change the reactive pattern of muscles before the neuronal network of ‘pain’ is laid down and reinforced altering the way the body moves. This pattern can start to reinforce itself in a negative way. By switching off the reactive muscles allows for any neuronal networks for ‘pain’ to not be reinforced thus reducing the experience of pain. This can be done by kinesiology. Essentially kinesiology identifies and activates a negative neuronal pathway, floods it with a positive stimulus allowing a new neuronal pathway to form i.e. neuroplasticity. Chronic Infection causes Chronic Disease: since about 90% of the cells in our bodies are ‘bugs’ – parasites, bacteria, fungus, cancer – and the ‘particles’ of all of the above, it’s important to keep them working ‘for us’ instead of working ‘against us’. Most disease, especially those of auto-immune conditions – are the ‘bugs’ definitely working against us. It has commonly been said that the era of pathogen-induced infectious disease which plagued previous generations has passed, to be replaced instead with the era of lifestyle-induced chronic disease. It may be, however, that the two are inextricably linked. Instead of acute, ravaging infections which result in severe organ damage or death, it seems the more common type of infections today are simmering, low grade ones that promote inflammation, cause oxidative stress, damage mitochondria and, ultimately, drive chronic disease. This relationship between low grade microbial infection and chronic disease was first identified in the 1950’s with the discovery of viruses as drivers of carcinogenesis, such as hepatitis B in liver cancer and human papilloma virus in cervical cancer. Since that time, links have been made with infectious causes in conditions as varied as arthritis, Alzheimer’s Disease, gastric ulcers, chronic fatigue syndrome, autism, obesity and even cardiovascular disease. 80% of infections cannot be found in medical tests. We use a combination of live blood screenings, urine tests, kinesiology testing and Chi Nei Tsang Abdominal Massage to discover where infections may be lurking in your body. Inflammation decreases during HCG: I’ve had clients who have struggled with weight for years, and HCG turns them around brilliantly. Did you know that inflammation and weight gain go hand in hand? Good luck and keep the faith. HCG works! Endocrine/Hormonal Issues. Within the processes of kinesiology there are ways to help to re-boot the hormonal systems of the body, which are often activated by a huge stress/trauma or a toxic overload of some sort. Kinesiology can help to target the cells/organs which are dysfunctional and re-balance the energy in these organs. Are you sick of Infertility? PMT? Pain? Being grumpy? Depression? LEAP: Learning Enhancement Acupressure Programme – this process helps to re-integrate pathways in the brain that are dysfunctional. The entire process may take anywhere from 5-20 hours depending on how neurologically out-of-whack the body is. NOT: Neural Organisational Technique – this process re-organises the neurology in the body and can be used to support structural problems such as jaw and hip pain, scoliosis, whiplash and neck problems, chronic back pain. Just about all arthritis starts with an imbalance in the body. Energetic Healing: When our energy is out of balance, ‘blockages’ occur in the body. Kinesiology can target ”weird energy” like chakras, auras, figure 8 energies, negative attachments that are causing problems for you overall. Nutritional Kinesiology: Do you absorb your food? Supplements? Protein? Carbohydrates? Sugars? Kinesiology can find out which organs are affected negatively by your foods and supplements and help your body accept and absorb nutrition better. Toxicity Work: We can use kinesiology to find the pathways in the brain, liver, kidneys which are being blocked by toxins such as lead, mercury, cadmium, aluminium… This can cause chronic fatigue, fibromyalgia, just about any health problem. we have great success – learn why! we work totally differently to the medical profession. naturopathic remedies for pain relief – the science is there!!! Are you sick of pain? Come along and hear our team, ask questions and feel confident that something CAN be done! You are currently browsing the archives for the Pain category. Far Infrared Sauna Therapy: detox at New Leaf Wynnum! Is the Vegan diet right for you?